The Little Sisters of the Poor are an international congregation of Roman Catholic women religious founded in 1839 by Saint Jeanne Jugan. 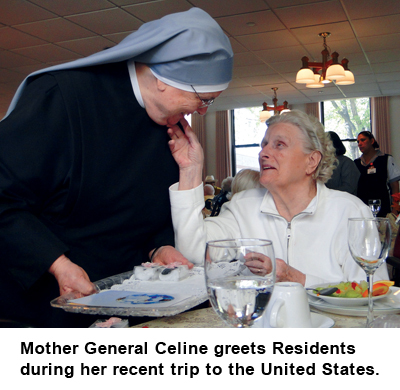 Together with a diverse network of collaborators, we serve the elderly poor in over 30 countries around the world.Continuing the work of Saint Jeanne Jugan, our MISSION is to offer the neediest elderly of every race and religion a home where they will be welcomed as Christ, cared for as family and accompanied with dignity until God calls them to himself. REVERENCE for the sacredness of human life and for the uniqueness of each person, especially those who are poorest and/or weakest. This is reflected in care that is holistic and person-centered. FAMILY SPIRIT: a spirit of joyful hospitality embracing all with open arms, hearts and minds; fostering participation in the life of the home and rejecting all forms of discrimination. HUMBLE SERVICE: the desire to raise others up and to put their needs before our own; an appreciation of simple, everyday tasks and experiences and humble means in accomplishing our work. COMPASSION: empathy for sharing the weaknesses and sufferings of others; eagerness to relieve pain in all its forms and to make the elderly happy. STEWARDSHIP: the recognition that life and all other goods are gifts from God and should therefore be used responsibly for the good of all; trust in God’s Providence and the generosity of others to provide for our needs; just compensation for our collaborators; a spirit of gratitude and sharing.